I'm not one who necessarily believes that comedy sequels are necessarily going to be horrible. I understand the case that is made for why many of them are and do in fact agree that Dumb and Dumber To may be one of the worst movies ever made, but as a rule of thumb, as a blanket statement, I like to think there is more to this phenomenon than that. No one will argue that comedy is the most difficult genre to pull off successfully and when one does so to the effect that it connects with a large group of people it is hard to not want to return to that well in hopes of capturing those same gracious returns once more. What is strange about this latest nostalgia-fueled sequel though, is that it didn't seem to connect with many people upon its initial release back in 2001. Ben Stiller likely knew this about his dimwitted male model character when he came up with it for a pair of short films for the VH1 Fashion Awards in 1996 and 1997. Stiller knew there was never a real chance the character would catch on or even that his modest comedy would make a boatload of cash, but he clearly loved the material and put his creative mind to the petal to not only come up with something silly, but something topical that provided commentary on the frivolity of the fashion world when compared to something as sobering as sweat shops and child labor laws. Then, something happened that Stiller never would have guessed or foreseen in a million years-Zoolander became something of a staple of the post 9/11 world in that it was released a few weeks after the attacks and provided some much needed silliness to divert our national consciousness away from all the horrible things that were happening. In this regard Zoolander, a film about the titular idiot model becoming the pawn of corrupt fashion executives in order to assassinate the Prime Minister of Malaysia, held a special place in many people's hearts. It didn't hurt that the film was a genuinely good, funny comedy, but that fondness for this safe haven of a comedy has now snowballed into a world dominated by social media that consistently referenced and recapped the original enough that Stiller and co-stars Owen Wilson and Will Ferrell (each who have long since passed their pique popularity) couldn't help but to re-visit these characters in hopes of reaping those gracious returns once more. Instead of being the warm, safe place to return to in times of sadness or stress though, Zoolander No. 2 only makes it clear how sad the reality of these characters lives actually are. Even worse, the legacy of Stiller's once pristine fashion satire is now tainted by having dressed it up in something ugly. 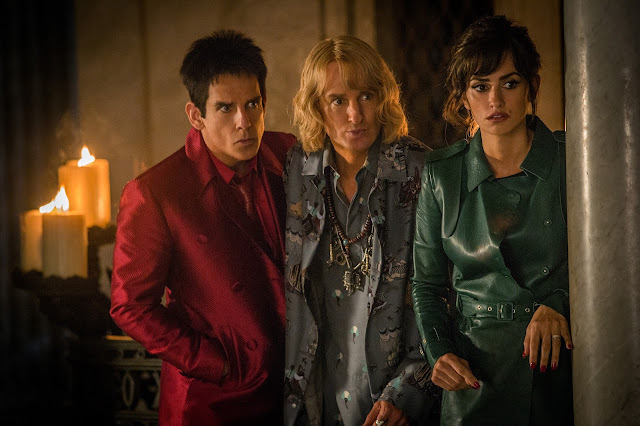 Derek (Ben Stiller), Hansel (Owen Wilson), and Valentina (Penelope Cruz) are hot on a new case in Zoolander No.2. To give you an idea of where I'm coming at this sequel from is to simply say that I love Zoolander. At the time of the original films release, I was fourteen years old and didn't see the movie until early December while attending a couple of friend's joint birthday party where we all decided to see a movie at the local dollar theater. We didn't know what Zoolander was, but we knew it had the guy from Meet the Parents and the guy with the nose from Shanghai Noon that was also in Meet the Parents, so we were game. It may not have been an instant classic, but over the years Zoolander became the kind of flagship film for the once domineering Frat Pack and a reliable quote factory for people of a certain generation. In fact, I could give you a handful of signature moments from the film if you were to stop me on the street at any moment. I've watched the film so many times, but all of this only made my concern for a sequel even greater. Obviously, comedy sequels have that certain reputation I touched on earlier and with all of the three main stars having careers that have more or less been on the decline in recent years it seemed the reason to do a sequel to Zoolander was more a desperate attempt at capitalizing on one of their more cherished properties rather than for any artistic or relevant story reason. If something radical had happened in the fashion industry or if Stiller again wanted to craft a social commentary through the guise of male models running around with their shirts off I could understand and see where, given the climate, it might be fun to explore how Stiller's Derek and Wilson's Hansel might fit into such a conversation, but none of these things are the reason we have a sequel to Zoolander. Rather, it seems we have a sequel to Zoolander because Stiller has now made three Focker and three Night at the Museum films and with his last directorial effort, The Secret Life of Walter Mitty, not going over as well as expected-it was the obvious, reliable choice. That and it feels like Justin Theroux has been working on the script since 2005. For as long as it seemed that Theroux (who returns here as the creepily suspicious DJ) worked on the script though, it is concerning to think that what we have here is what he worked on for so long. Even more frightening is that he collaborated with both Stiller and Nicholas Stoller (director of Forgetting Sarah Marshall, Get Him to the Greek, and Neighbors) as well as long-time Stiller collaborator John Hamburg and what we have is a hodgepodge of ideas that have something to do with the fountain of youth and Zoolander's son, Derek Jr. (Cyrus Arnold), who just so happens to be the chosen one. In the end though, I don't even think they stick with that outlandish narrative, but rather just use it as an excuse for Ferrell's Mugatu to hatch this master plan of breaking himself out of high security fashion prison. Going in and through the first few scenes I was hopeful though. There were real hints of what made the first movie so ridiculously fun and yes, ridiculously good looking. It becomes apparent that Stiller is not only aware of how absurd it is that he's just now making a sequel to a fifteen year old property, a property that fifteen year old's these days will relate to the same way fifteen year old's in 2001 related to Ghostbusters, but that despite this time span he is still able to be very much in tune with this character. In seeing so many of these nostalgia-fueled follow-ups that have graced our big and small screens over the last few years it has become clear it's not always easy to fall back into a character you thought you'd left behind long ago, but Stiller does so with ease here. Unfortunately, the same cannot be said for Christine Taylor as she's abruptly forced out of the picture to make way for Penelope's Cruz's new character or for Ferrell who in some scenes seems to be playing a different character altogether. There are times, especially during the climax when Ferrell reaches back into his bag of tricks and pulls out something that would have fit perfectly into the original film, but other times and surprisingly when he's sharing the screen with Kristen Wiig's plastic surgery obsessed designer Alexanya Atoz, the jokes are as flat as his platforms are high. Alexanya (Kristen Wiig) and Mugatu (Will Ferrell) plot to take over the fashion world together. Believe it or not, Zoolander No. 2 isn't all bad though, and interestingly enough what saves the film is what begins to pull it down after its rather promising start. The set-up is golden, the recap of what's happened in the interim between 2001 and 2016 is actually pretty great in how it breaks down each year and the progressive decline of Derek's life that leads to him living in a cabin in extreme Northern New Jersey. We then are swiftly delivered the Billy Zane cameo we were promised giving way to Derek and Hansel making their way to Rome and reconnecting for the first time in fifteen years. Their arrival just so happens to coincide with the fact all of the world's most beautiful people are being systematically assassinated with Zoolander's trademark "Blue Steel" look on their face. This brings Cruz's Interpol agent into the picture as she recruits Derek and Hansel to help her figure out what is happening and why Zoolander's signature look seems to be at the center of it. So far, so good right? Sure, well enough at least even if Wilson is on more of his autopilot level of performance than actually seeming to care about anything, but then the cameos pick up as do the retreading of old jokes and the ambition of what this sequel could have been begins to go down. Some of the references are subtle enough they're funny without being distracting, but others are so blunt they are basically repeating the same joke in hopes of getting a laugh for nothing more than recognizing the fact it's the same joke. Zoolander No. 2 runs into this problem a lot: stating the obvious about pop culture components and expecting a laugh for simply recognizing them rather than crafting a joke around them. Like some of the old jokes, some of the cameos work. I won't spoil too many of them, but Kyle Mooney in a supporting role absolutely kills it as does Kiefer Sutherland in a recurring bit that has him sporting a bizarre relationship with Hansel. On the other hand, poor Fred Armisen. Of course, none of this is enough to make up for the many shortcomings and shortcuts this sequel takes. 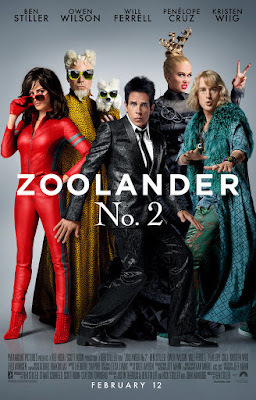 I wanted so badly for Stiller and his crew to buck the trend of comedy sequels and for him to not pollute the legacy of the original, but in the end Stiller has made of Zoolander what should never be able to describe a model, much less the most famous one in the world: a hot mess.